Pre-construction and general contracting services on this approximately 200,000 s.f. tenant improvement project that relocated St. Joseph Health from Orange to an existing building in Irvine, California. The new space provides St. Joseph’s employees with some of today’s newest space solutions. The new improvements constructed in the St. Joseph space are also reflecting the trends we see in the tenant improvement world. Large open spaces that allow a lot of natural light throughout the space, innovative office furniture systems, less offices and conference rooms allowing for more open collaborative work areas, hoteling stations for flexible work space, wellness center and sophisticated technology, audiovisual and access control systems. All of the above resulting in an attractive and energetic workspace for valued employees. 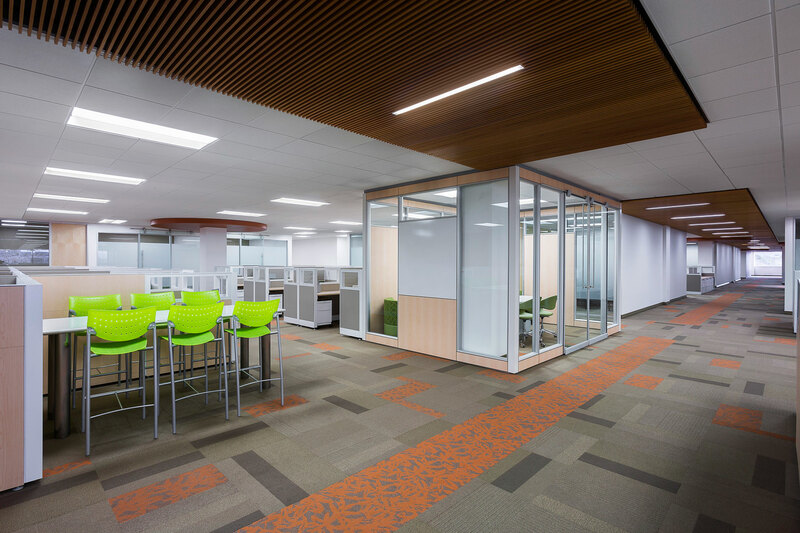 Snyder Langston worked closely with the St. Joseph Health team, the landlord and design consultants to finalize a design that met the tenant’s requirements while fitting into their budget and schedule goals. The project team worked together closely in pre-construction developing a plan to have the nearly 200,000 s.f. of construction complete and all employees were moved into the new location in four months, from start of construction.